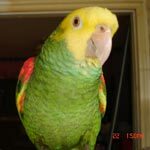 Parrot Forum • View topic - Einstein CAG battles a foe! Einstein CAG battles a foe! It's a hilarious video of Einstein fighting the dust pan. Look how mad he looks! Re: Einstein CAG battles a foe! This is nothing new to me. It feels like nothing in my house has gone untouched. I have a thing to hang my broom, mop and duster. Myrtle will even land on them and chew up any part that is chewable. Everything shows the marks of a parrot demolition. Myrtle has even chewed her way into the top of my pantry cabinet then chewed all the packages on the top shelf. She ignores my calls when I am looking for her and only makes a noise when she needs help getting out. My son has had to protect it with thick plywood. I bought an old house for than reason. As sloppy as Rachel is I don't care if I leave her a house with parrot marks. This is probably my last house and I an my critters are living in it the way we want. Have you ever thought about putting objects that the birds are a bit unsure of on things you dont want chewed? What kind of things would that be. Myrtle does out of sight out of mind. If she is getting into something small I can just throw a towel or table cloth on it. I can't do that with my whole house. I have no idea what would deter parrots when they really want to get at them. Rachel had to start covering her jewelry chest when Myrtle started flying. She was opening the door and stealing. She even pulled the drawers open to thieve. She is stronger now and can open my kitchen cabinets. I put hair ties on the knobs.